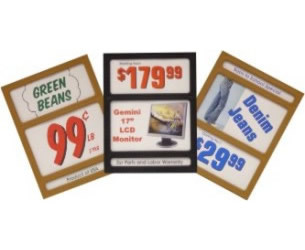 These three-window molded plastic sign holders measure 8 1/2" X 11". Each window holds an individual paper sign that you can easily create using your own inkjet or laser printer. The holders have slots on both sides for easy insertion of the signs, and they are drilled top and bottom for threaded screw hooks which are included. Call today for pricing on this stock holder.